Ok, so your mom could totally make a spaghetti sauce like this. But mine doesn't, so hence the title! One day I'll post my recipe for a basic tomato sauce (from actual tomatoes), but I know that most of you will find this recipe more in your comfort zone. Top three reasons why I love this recipe? 1. The Hubs likes lots of meat in his spaghetti sauce. 2. The house smells ah-maze-ing while this is simmering! 3. 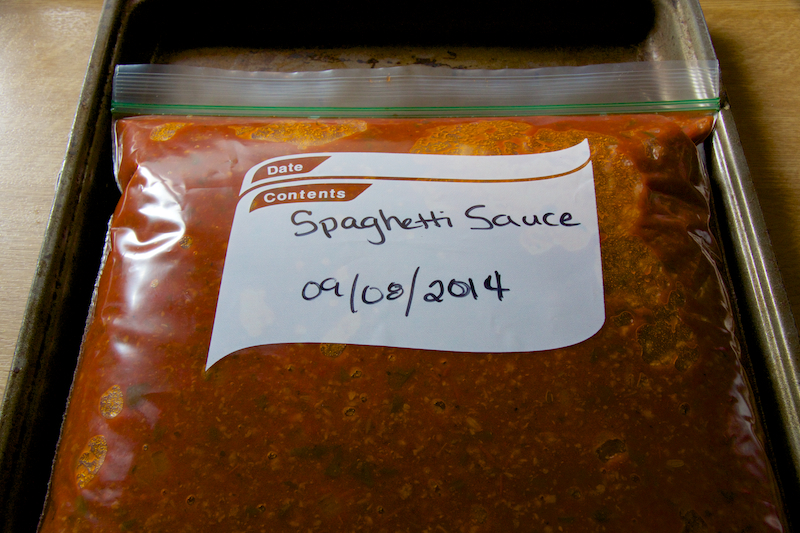 This sauce freezes easy for later use. I make this and freeze in advance whenever we have family visiting. This way, I look awesome for making my own spaghetti sauce, but I don't have to waste precious visit time with cooking. Win win! You also need 1 pound each of ground beef and ground, mild Italian sausage (somehow, they didn't make it into the picture). I'm going to tell you all my secrets for making awesome spaghetti sauce… simmer, simmer, simmer and always allow your sauce to rest overnight before using. Seriously, my friends, trust me! These two things alone can make or break your sauce. 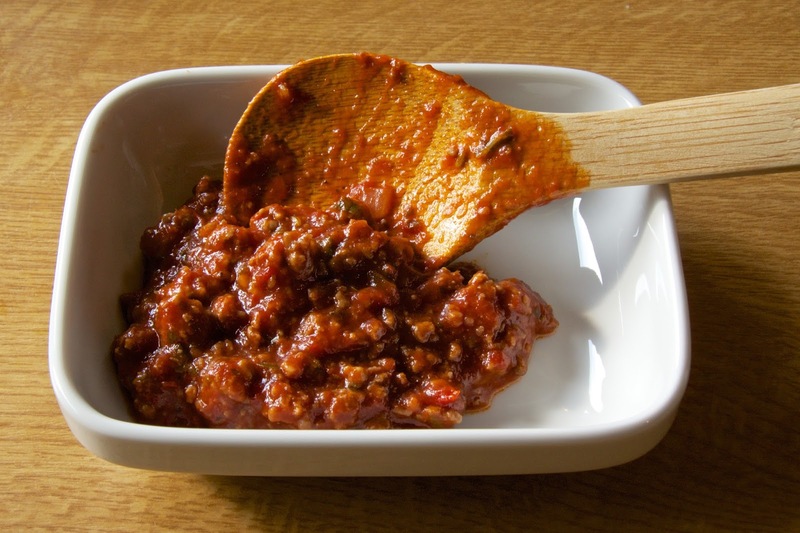 Really wonderful sauce allows plenty of time for those delicious flavors to meld. 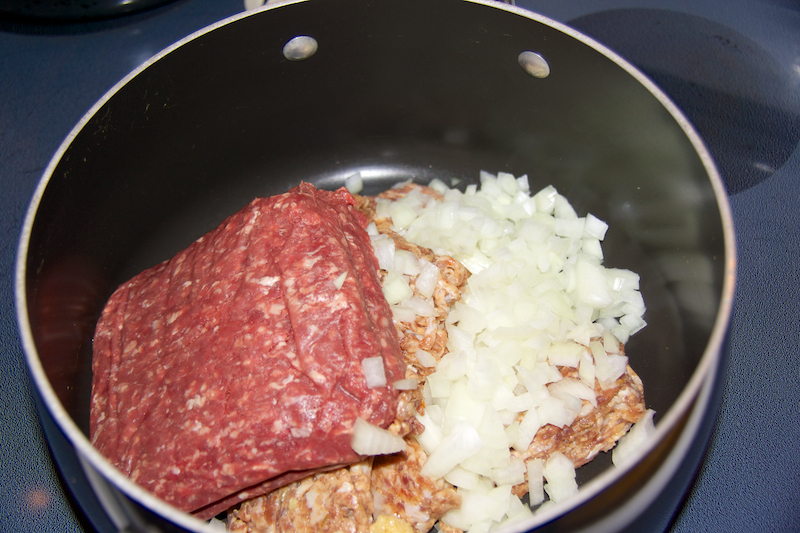 Add your ground beef and sausage to a large pot, along with ½ of a diced onion and 2 cloves of minced garlic. Brown the meat, and then drain the fat from this mix. 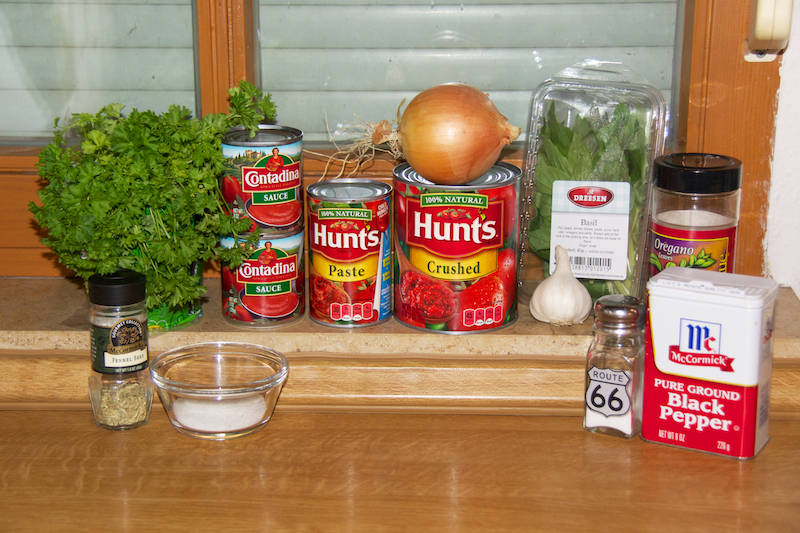 Next, we add in all our tomato products - 28 ounces of crushed tomatoes, 16 ounces of tomato sauce, and 12 ounces of tomato paste. Also add in a ½ cup of warm water (this keeps the sauce moist during all the simmering). Combine well with the meat, and let the mixture warm up a bit because we're going to add in all the yummy spices next. For the seasoning mix, I use: 1 teaspoon of fennel seed, 1 tablespoon of fresh basil (chopped), 2 tablespoons of fresh parsley (chopped), 1 teaspoon of oregano, 1 teaspoon salt, ½ teaspoon fresh ground black pepper, and… 2-3 tablespoons of white sugar. Yep, you heard me right! SUGAR. This is of major importance, peeps. The sugar helps reduce the sharp acidic flavor of the tomatoes. You can add as much or as little as you like, but taste as you go. The sauce will become sweeter as it simmers, so don't add too much. Then, you just wait for the magic to happen! Let your sauce bubble and blend over low heat for at least 90 minutes. Stir it occasionally. Once in a while, sneak a taste. Relish in the joy that is spaghetti sauce. At the end of 90 minutes, turn off the burner and allow your sauce to come to room temperature before you refrigerate it. This prevents too much condensation on your finished product. Cover and refrigerate overnight before using. I particularly like to use this sauce in my lasagna recipe, which will hopefully be coming to the blog soon! But it's just as awesome on plain old spaghetti noodles with some garlic bread on the side. I'll be back soon, my friends. I've missed you during this family visit, and I can't wait to be back to blogging. As always, the standard recipe is below. Begin by browning the sausage, ground beef, onion, and garlic together in a large skillet or pot over medium heat until the meat is no longer pink. Drain the fat. To the cooked meat, add the crushed tomatoes, tomato sauce, tomato paste, and the water. Stir well to combine. Stir all of the seasonings into the mixture. Simmer at least 90 minutes over low heat. Remove sauce from heat and cool to room temperature. Cover and refrigerate overnight before using. Perfect for lasagna recipes or a spaghetti dinner.